We are Country Bumpkin Yurts; a countryside experience combining glamping and a cafe under canvas. Occasionally each of us craves space and time away from it all – glamping in yurts is a wonderful way to feed that need. Glamorous camping may seem like a contradiction, but the reality of it combines our love of luxury with our deep yearning to be in the wild. 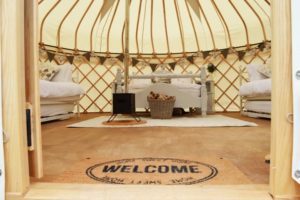 Based on a farm in Great Oxendon, Country Bumpkin Yurts has introduced a new way to relax and enjoy the East Midlands countryside. With bridleways, great walking, cycling, leisure and eating out opportunities just a stones-throw away, we can’t wait to welcome you to your relaxing retreat. Our idyllic farm setting is the perfect place to unwind and re-connect with nature and the people you love. Whilst staying with us, you will get to see the workings of a family-run farm – Waterloo Cottage Farm. You will meet the lively little piglets, the highland cows, and the cheeky lambs. You’ll also meet the two friendly farm dogs as you roam the site. Children especially love meeting the animals. Our site comprises of three traditionally designed yurts, spacious and with full access to all the modern amenities. Each yurt is based on a wooden platform, with picturesque views across the farm and surrounding area. A log burner, shabby chic furnishings and cosy beds are in each tent so you can rest in comfort and style. With rustic-luxury shared bathrooms and a kitchen, you will have everything you need. Our wood burning hot tub makes it a glamping site for those looking for an extra special stay. 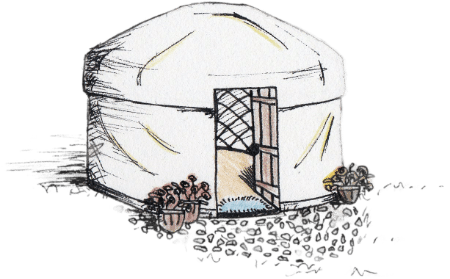 We should explain what a yurt is! Yurt is Russian for ‘Dwelling’. It is a nomadic shelter lived in for thousands of years by tribes from the near East and Central Asia. Country Bumpkin Yurts have built upon this traditional structure and added a dose of luxury! A stay in a yurt will allow you to experience the uplifting and calming effects of living without corners in a circular space, conducive to balance and harmony. And the roof window lets you watch the stars across the sky as you feel yourself unwind. The yurts architecture is not only extremely practical but also aesthetically beautiful. 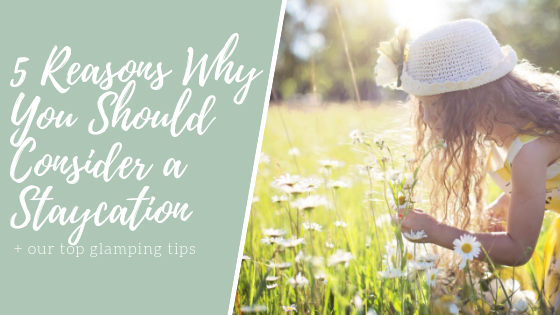 If you ever decide to leave your beautiful yurt, you will find plenty to do both on and off the farm. Whether you explore by foot, on two wheels or four, you will be enchanted by the area that we love. The East Midlands is your oyster. The Canvas Cafe is all about celebrating and serving great local food and drink in a unique setting. We love to bring people together to share a mini countryside adventure over a meal or coffee. Our cafe is housed in a beautiful big marquee - we like to be different. Our passion for the area has born a commitment to use great local producers and suppliers. This reduces our food miles and enables us to team up with some wonderful local businesses. Our menu is developed using seasonal, organic, and free-range food where possible. Just on our doorstep (literally) is the Waterloo Cottage Farm Shop, which provides meat from naturally reared, pasture-fed and happy animals. There is also a thriving community garden on site. Imagine eating a soup made from the vegetables picked that morning from just 10 meters away - talk about fresh! We are a cafe that cares. We care about looking after nature, we care about people getting together, and we care about health.